Go to a taco restaurant and you'll meet an NFL player. Babalu Tapas and Tacos is a southern-influenced restaurant that sits on East Boulevard in Charlotte, North Carolina. Ever since its recent opening on July 25, the eatery has served hundreds of people, including Carolina Panthers Linebacker Luke Kuechly. If you live in Charlotte, North Carolina, you’re a Panthers fan. If you live anywhere near North Carolina, you’re a Panthers fan. Therefore, any fan would consider coming face-to-face with Luke Kuechly a dream come true. Being the fan of Luke that I am, my sister’s alert caused my vision to blur and my breath to shorten. My eyes finally focused on Luke himself, walking right in front of me. As he exited Babalu, I grabbed my brother and sister and chased Luke outside. I called his name until he finally turned around and I nervously asked, “Would it be alright to take a quick picture? I know this is super annoying so I’ll make it quick.” Although he is constantly bombarded with fans asking for autographs or getting a photo taken, Luke graciously accepted my request. After posing for a picture, he darted off towards his car in hopes that no one else would delay his departure. 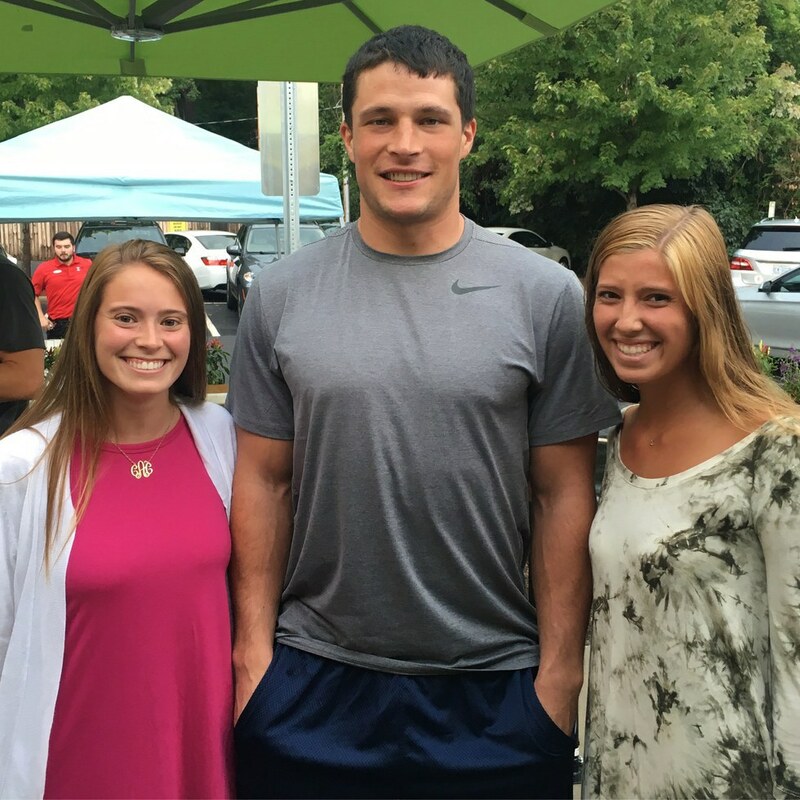 Meeting Luke Kuechly made my bucket list and the 45-minute wait for dinner shorter. The 2018 NL MVP is on a record-breaking pace. While Wisconsin sports teams are often starved when it comes to team accomplishment (the Packers' 13 championships notwithstanding) they have seemed chockfull of individual accomplishment as of late. Be it Aaron Rodgers' 2011 and 2014 MVP campaigns, Ryan Braun's 2011 MVP win (despite later acknowledging his use of steroids during that and other seasons), or Giannis Antetokounmpo's likely MVP grab this year based on his appropriately freakish regular season performance, Wisconsin is no stranger to individual sporting excellence. And yet, even then, what Christian Yelich has managed to do is nothing short of amazing. As 2018's National League MVP, expectations were high for Yelich, but many forecasts also offered the possibility of regression. After all, 2018 offered a lot of firsts for Yelich. After being caught up in the black hole that is the Miami Marlins for the first five years of his career, Yelich was dealt to Milwaukee in a January trade. And he took to his new surroundings nicely, with a slash line of .326/.402/.598 and 36 home runs, bringing the NL batting title to the Brewers for the first time ever. He was named to his first All-Star outing and won numerous awards (Silver Slugger, Hank Aaron) before ultimately capturing MVP. No, no one would've blamed Yelich if he had slipped a little bit, but in fact, the exact opposite has happened: he's red hot. Including his most recent home run tonight against the Dodgers, Yelich already has 10 such scores in the Brewers' first 20 games of the season. He has appeared at bat 77 times and is clocking in with an incredibly competitive .351 batting average. With that number, he's currently 7th in the National League, a mere .001 points ahead of fellow Brewer Yasmani Grandal. The profound thing, beyond these surface level statistics, is that Yelich might be getting even better. As reported by the Brew Crew Ball blog, Yelich continues to hit the ball hard, as he did last season, with a hard-hit rate of 56%. However, he has also increased his average launch angle or the trajectory by which he hits the baseball. Sitting currently with an angle of 14.9 degrees, Yelich is far and away above his previous career-high of 4.7. By joining the growing league of MLB sluggers who are intent on "lifting" the ball as a part of their batting strategy, Brew Crew Ball projects that Yelich could actually see his home run total increase this year, rising to 42 in total. And even that is a conservative number compared to what FiveThirtyEight calculated last season. Looking at the very same aspect of Yelich's game in September of last year as the Brewers were making a push for the playoffs, the stats blog noted much the same as Brew Crew Ball now: if Yelich's home run to fly ball ratio (HR/FB) were to hold and he had hit flyballs that much more frequently than his 24% rate, say at the MLB average of 35%, he could have hit 51 home runs in 2018. Increase that flyball percentage closer to 50-50 (as players like Matt Carpenter have been keen to do) while maintaining the same HR/FB ratio and Yelich, in theory, could have hit 72 homers in 2018. For comparison for non-baseball statheads (of which I would not necessarily count myself) the single-season record for home runs is Barry Bonds' 73 in 2001. And while it may be too early to speak of Yelich and Bonds in the same breath (especially as Bonds' controversial history with steroids continues to unfold) it is no point of equivocation that Yelich is off to a phenomenal start to the season in defense of his 2018 MVP award and the Brewers' position as the number one team in the National League. While the Milwaukee Brewers have yet to see a World Series banner hoisted in their home rafters, there is little doubt that they are serious competitors with a statistically astronomical slugger that can do no wrong; he can only get better.